The A-6A Intruder first flew in 1960 and entered service with the US Navy in 1963, and then provided its services for the next 34 years. The A-6A Intruder was a low level all weather night attack aircraft. The A-6A Intruder saw service during the Vietnam War, where due primarily to the role they performed 86 US Navy and US Marine Corps aircraft were lost in action. Upon opening the box you get that kid in a candy shop feeling as you are confronted by a huge amount of plastic and other goodies. The sprues are very clean, with the only thing I noted being a few cooling or flow lines in some areas, Flow lines can cause issues with the finish but I detected no issues with these. The bagging method used by Hobby Boss has prevented any scratching of the parts and kept everything where it should be. The box for this model is very large, and I know from experience that the box size can often lead to disappointment when it is opened, that cannot be further from the truth in this case as the box is full with the exception of one end that is sectioned off to protect the clear mouldings. You will not be surprised with me starting in this area as most models cover assembly of this area first. 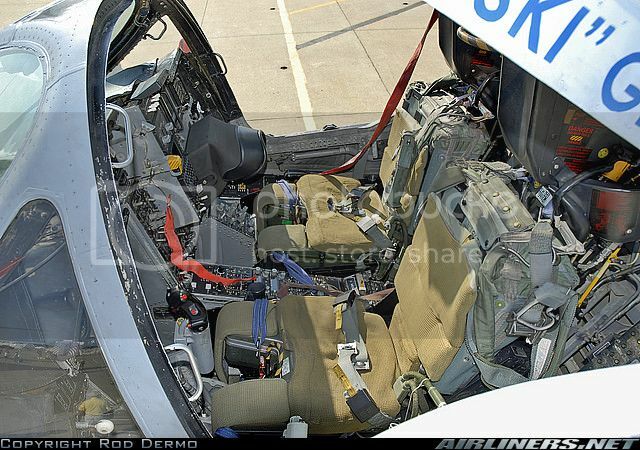 Starting with the ejector seats that do look to me to be very good, assembly should be straight forward, and with the addition of the photo etched harness detail provided by Hobby Boss adding a nice finish. The cockpit tub also looks nicely thought out with the parts count being kept down while still providing a nice level of detail. I cannot say a lot about the side and centre console detail, other than there is a lot of raised detail and no decals or painting instructions, so you will need to do some searching online or in books to get beyond the ‘paint it black’ command Hobby Boss has provided. It is worth mentioning that Hobby Boss has depicted the Bombardier/Navigators seat slightly lower than the pilots which is accurate. The instrument panel is also nicely detailed, but I could not find a perfect match for the layout, it was however close to quite a few images; again Hobby Boss just tells you to ‘paint it black’ and the screens painted clear green; I never knew the Rolling Stones were so big in China! The cockpit as far as assembly goes will come together at a good pace and the detail painters with have a lot of fun in this area and the kit builders can move on quickly to the next stage. 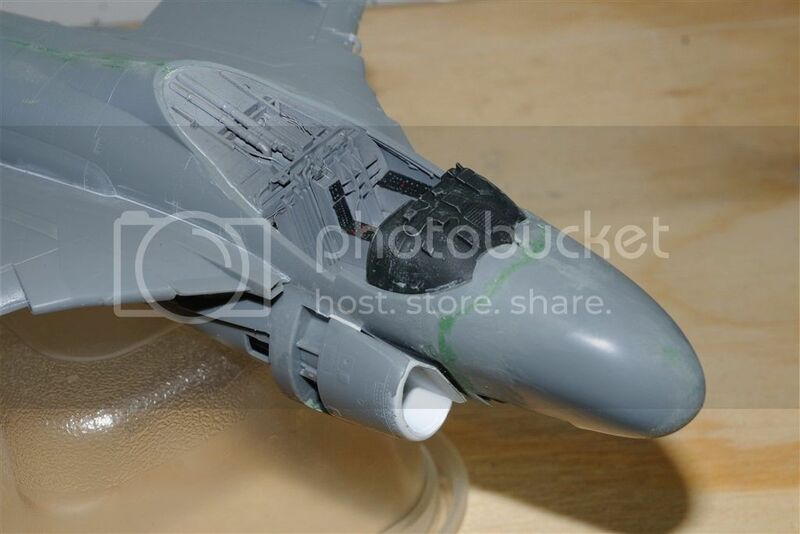 This is a very nice area of the model as regards provided detail, and of course it will be easily seen through the large canopy be it open or closed. The only downside is the lack of good painting information, which is a shame on such a well designed model. The undercarriage legs are supplied as white metal offerings which for the most part are encapsulated in plastic, this is a nice touch I have not seen before and should provide the needed strength without impacting on detail. The main plastic parts for the undercarriage legs do look a little soft on detail; by this I mean the detail is there but the crisp demarcation points are not as crisp as they could be. The wheels for the model are very well detailed only missing out by the weighted look not being present. One other thing I would like to raise is that the instructions tell you to build the nose wheel bay and install the front wheel assembly, as this assembly is added to the model at quite an early stage; I recommend you give this some thought before adding the front strut at this point. The addition of the brake lines is one improvement I would consider for this area, but otherwise it looks fair to good in my opinion. The jet intakes and exhausts look good to me with Hobby Boss providing a fair amount of the engine trunking. The compressor detail on the intakes is reasonable, but I am not sure about the exhaust detail as it looks a little simple. It will be difficult for me to say for sure on the exhaust detail until the model is built and may be fine. The exhaust portions of the engines are added as part of the inboard wing assembly, which is a novel approach. A very detailed radar assembly is supplied with the model, and this is another area where the detail painters will have fun. I cannot comment on the accuracy of the radar assembly, but it does take a fair number of parts. Due to the number of parts that go into this radar, if it is not accurate I do believe that Hobby Boss took a fair crack at it and it should look good if exposed to the viewer. The fuselage is supplied in two halves split centre top and bottom, the nose is supplied separately and is also split in the same fashion as the fuselage. It is at the stage when you close up the fuselage that the nose wheel is added to the aircraft and I stick to my belief that it is inviting breakages and damage if the strut has been installed at the recommended stage. The recessed panel lines are nicely replicated on the mouldings and should look good when highlighted. I have a limited reference for the A6 Intruder and not all of the panel lines match up with my limited reference, this could mean that the model is wrong or more likely that I do not have the correct drawings for this particular aircraft variant. The built in mounting ladders for the aircraft are replicated on both sides of the model and Hobby Boss has done a great job of replicating this element of the aircraft, you can of course close them up if wished. The fuselage air or speed brakes are nicely replicated and can be displayed open or closed; one thing that will need to done is to open up the slots for the legs of the brake and a piece of scrap plasticard glued inside the fuselage to hide the surgery. 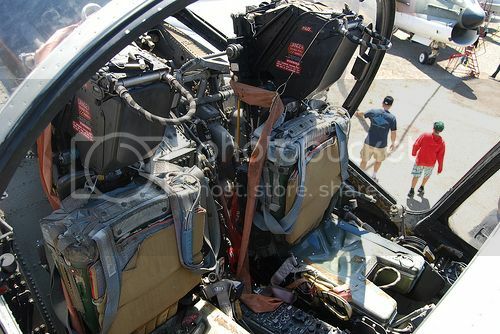 The rudder of the aircraft is supplied as a separate assembly and so could be set in any desired position. Hobby Boss has built quite a few options in this area of the model which allow for a number of display options on the finished model, consider carefully how you want to display your model rather than trying to use all of the options available to you as it could make for an odd look. One concern with closing up the fuselage is that no mention is made of adding weight to the nose to prevent a tail sitter. Hobby Boss has really gone to town on the wings of this model offering some great options straight from the box. All of the flaps can be posed as can the leading edge flaps; the speed brakes also have the option of being open or closed on the model. Finally Hobby Boss has provided the option of depicting the wings folded or deployed, I suspect most will opt for folded wings as the detail built in this aspect is very nice and should be an eye catching element of the model. Braces for the wings are supplied with the model if you wish to use them. The emergency ram air turbine is also included as an option to have deployed on the rear of the pilots side wing. Well done with all the options here Hobby Boss. The clear portions of the canopy are very good with the fixed screen being excellent as regards a clear view without distortion, the main canopy does cause a little distortion, but it is minimal being very thin. Hobby Boss has remembered and included the rear view mirrors in the form of photo etched parts which is a nice touch. I think you will agree that this is a nice mix of weapons systems for your model. The instruction booklet is nicely laid out and guides you through construction using black and white line drawings. The use of these line drawings is not always clear as to placement of parts, but if care is taken and placement checked, you should be ok. The painting instructions called out during construction is good, but I would like to see better painting instructions on areas such as the consoles and instrument panel. The full colour sheet covering painting and placement of the decals on the exterior is quite good in my opinion, and this glossy sheet should allow you to get a good result. As with most models these days as they become more involved and details improved it is a good idea to collect up some reference in the form of either books on the subject or images and data from the internet. A very nice touch by Hobby Boss is the inclusion of a separate glossy sheet covering the painting and decal application to the weapons supplied with the model. This is one of those models that could be built in short order, or if all of the bells and whistles utilised could turn into a very long build; I believe this aspect of the model allows it to appeal to modellers across a broad spectrum. Moulded detail is fair to good, which is not bad for a model with so many options to it. The multi-media approach taken by Hobby Boss has a price attached to it, in this case £49.99; I feel the price is fair for a kit with so many options straight from the box. Those modellers that like to throw resin upgrades and photo etched sets at their models still have some wiggle room at this price as regards what to buy in addition before the price gets silly. Highs: The number of finishing/display options given to the modeller straight from the box is a great effort from Hobby Boss that will be appreciated I believe. Lows: I would have liked to see better detail painting instruction provided for at least the cockpit. Verdict: I have no concerns about recommending this model to you. Thank you for the feed back gents. Joes does it need the nose to be waited to avoid a tail sitter? I ask as I could not find any data in the instructions. If you have any good reference for detail painting the interior other than 'paint it black', it will be most helpful. Sorry Rowan I guess I got accustomed to 'target' kits running in this ball park figure and higher. I also remember those days Rowen, but I was lucky as my Nan worked for Airfix and one of my Aunts worked for Hornby.